In this article, I want to share a news article that I read on The Strait Times Singapore which I found to be very sad. 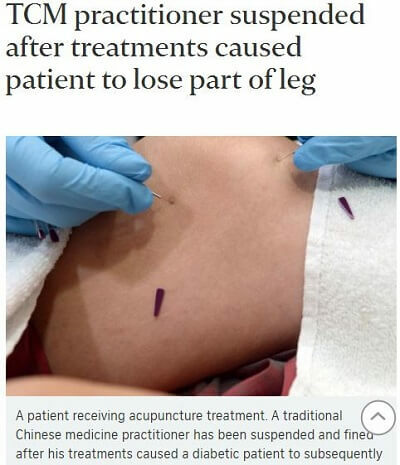 The title of the story is “TCM practitioner suspended after treatments caused patient to lose part of leg”. Apparently a diabetic patient went to a traditional Chinese medicine (TCM) practitioner in Singapore to get treated for poor sensation in both his feet. The TCM practitioner, Mr. Lee, 59 used heat lamp therapy on the sole of his patient. After the treatment, the patient developed blisters on his feet which broke when he tried to walk. The diabetic man went back to Mr.Lee to get treatment. Mr. Lee tried to clean the wounds by applying medication and bandaging his feet. But since the man has diabetes, his wounds did not heal and after 4 months, his left leg was amputated below the knee. This is truely very sad indeed. The man could have been suffering from diabetic neuropathy which causes numbness or tingling in his fingers, toes, hands, and feet. Walking can be very painful and the recommended treatment to relieve the pain is low impact exercise and proper diet to reduce blood sugar level. The idea is to prevent further nerve damage and to increase the blood circulation in the feet. The treatment of infrared heat lamp can be beneficial because it does help to improve our blood circulation. However, because the lamp uses electricity to generate heat that emits infrared rays, controlling the intensity of the heat can be challenging. In the case above, the heat lamp intensity was too much for the diabetic patient which caused the blisters. 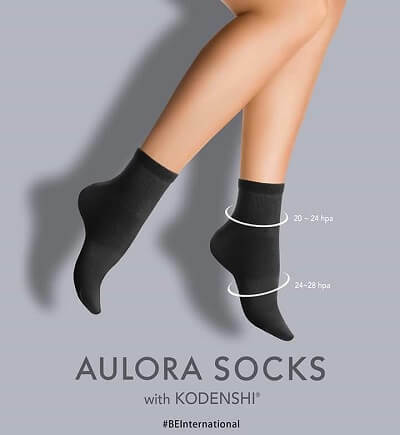 The same effect of infrared rays to improve blood circulation can be achived with the Aulora Pants and Aulora Socks from Japan. Since the Aulora garments use Kodenshi fabric technology, the far infrared rays (FIR) emitted from the fiber uses our own body temperature as the heat source. It is therefore natural and much safer compared to an electric powered heat lamp. If the diabetic man have known of the Aulora Pants and Socks, he could have gotten relieve for his feet numbness without having to go through his ordeal which led to his leg amputation. The good news is, the Aulora Pants and Socks are available in Singapore. If you know of any of your friends or family members who have diabetes and could benefit from the Aulora Kodenshi garments, you can click the link below to contact me on WhatsApp and I will assist you.